We weren't planning on making a tutorial today. But this hairstyle turned out pretty cute, so I decided to share this quick "crazy hair" idea with you. 1. Make a set of pigtails. 2. 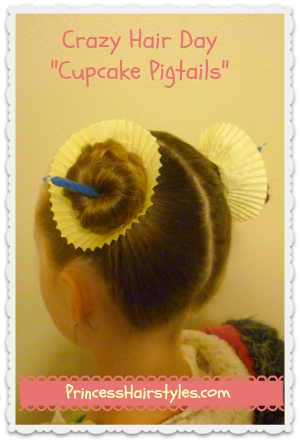 Take 2 cupcake liners and cut a hole in the bottom of each one with a pair of scissors. 4. 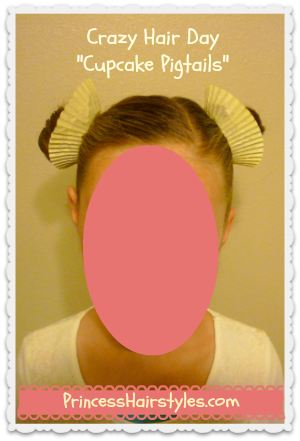 Push the liners up to the top of the pigtails on each side. 5. 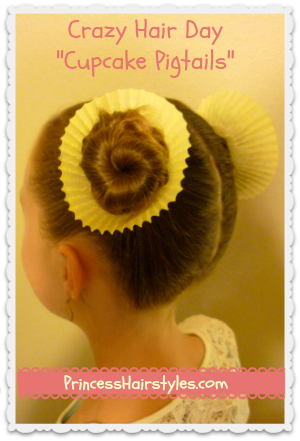 Wrap the hair up into buns inside the liners, and secure with clear elastics. You can make any type of bun you want. She wanted this to look like "swirled frosting" so I took the hair, twisted it, and wrapped it around itself. 6. (Optional) Decorate your "cupcakes." We stuck a candle through the center of each of the buns for a birthday cupcake look. You could also add glitter, "colored frosting" (hair chalk or spray,) a cherry... whatever you want! We would love to hear your crazy hair ideas in the comments. Or, if you have pictures of styles you have done in the past, please feel free to share them on our facebook page! It is always fun to see what you guys come up with. Love it! This is so cute, I really appreciate the extra post. We're doing this for my daughter's birthday on Sat. can't wait! :D thanks!! Thanks to you, my daughter has gone from a kicking screaming child when she even saw a hair brush, to bringing me her hair stuff for doing her hair. THANK YOU!